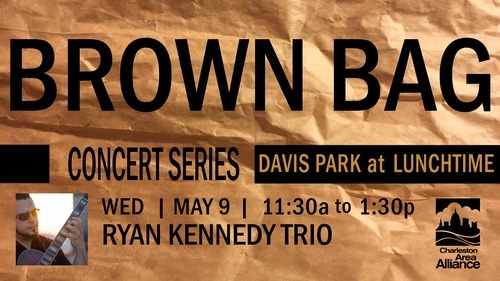 The Brown Bag Concert is a free lunchtime concert taking place in Davis Park this month, along the corner of Capitol and Lee Streets in Downtown Charleston with the Charleston Rogues with support from Spurgie Harkins.. Sponsored by American Medical Facilities Management, local musicians perform in various locations in downtown Charleston 11:30 a.m. to 1:30 p.m. the second Wednesday of each month May through October. The Brown Bag Concerts are planned in coordination with American Federation of Musician’s Local 136. Attendees are encouraged to bring their lunch, grab takeout from a Downtown Charleston restaurant or purchase on-site from local vendors. Tables and chairs will be setup for those attending. The lunchtime concerts stems from the Imagine Charleston Downtown Redevelopment Plan. The concerts are designed to showcase the talent of local musicians, encourage people to get away from their desk at the lunch hour and put a spotlight on the green space in Downtown Charleston. In case of inclement weather, the concerts will be held at Charleston Town Center’s Center Court.